This is a quiz that contains NCLEX review questions about pneumonia. Pneumonia develops when the lower respiratory system is infected with a bacteria, virus, or fungus. The infection causes inflammation and congestion of the alevolar sacs which causes hypoxemia. As the nurse, it is important to know how to care for a patient with pneumonia. In addition, the nurse needs to be aware of the causes, risk factors, and management of pneumonia. The NCLEX exam loves to ask questions about patient education, major signs and symptoms, and the different types of pneumonia. 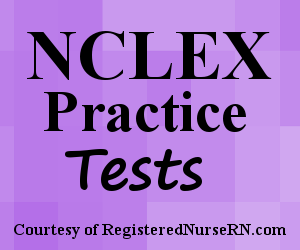 This quiz will test you on pneumonia in preparation for the NCLEX exam. A. A 53 year old female recovering from abdominal surgery. B. A 69 year old patient who recently received the pneumococcal conjugate vaccine. C. A 42 year old male with COPD and is on continuous oxygen via nasal cannula. D. A 8 month old with RSV (respiratory syncytial virus) infection. A. Encourage the patient to use it twice a day. B. The patient exhales into the device rapidly and then coughs. C. The patient inhales slowly from the device until no longer able, and then holds breath for 6 seconds and exhales. D. The patient rapidly inhales 10 times from the device and then exhales for 6 seconds. A. Keep head-of-the-bed less than 30 degrees at all times. C. Encourage 3L of fluids a day to keep secretions thin. E. Provide education about receiving the Pneumovax vaccine every 5 years. A. "I’ll use hand sanitizer regularly while I'm out in public." B. "It is important I don’t receive the Pneumovax vaccine since I'm already immune to pneumonia." C. "I will try to avoid large crowds of people during the peak of flu season." D. "It is important I try to quit smoking." A. "Do you take birth control pills?" B. "Are you allergic to Penicillin?" C. "Are you allergic to eggs?" D. "Do you have a history of diabetes?" A. "I will wear sunscreen when outdoors." B. "I will avoid green leafy vegetables while taking this medication." C. "I will monitor my blood glucose regularly due to the side effects of hypoglycemia." D. "I will take this medication with a full glass of milk." A. "I'm seeing yellow halos around the light." B. "My mouth tastes like metal." D. "I have this constant ringing in my ears." 1. A patient is presenting with mild symptoms of pneumonia. The doctor diagnoses the patient with “walking pneumonia”. From your nursing knowledge, you know this type of pneumonia is caused by what type of infectious agent? 2. A patient was admitted to the intensive care unit 48 hours ago for treatment of a gunshot wound. The patient has recently developed a productive cough and a fever of 104.3 ‘F. The patient is breathing on their own and doesn’t require mechanical ventilation. On assessment, you note coarse crackles in the right lower lobe. A chest x-ray shows infiltrates with consolidation in the right lower lobe. Based on this specific patient scenario, this is known as what type of pneumonia? 4. You’re caring for a patient with pneumonia. The patient has just started treatment for pneumonia and is still experiencing hypoxemia. You know that respiratory acidosis is very common with patients with pneumonia. Which arterial blood gases below represent respiratory acidosis that is NOT compensated? 6. You’re educating a patient with pneumonia how to deep breathe by using an incentive spirometer. Which of the following is the correct way to use this device? E. Provide education about receiving the Pneumovax vaccine annually. 8. You’re providing discharge teaching to a patient who was admitted for pneumonia. You are discussing measures the patient can take to prevent pneumonia. Which of the following statements by the patient indicates they did NOT understand your education material? 9. A patient is admitted with pneumonia. Sputum cultures show that the patient is infected with a gram positive bacterium. The patient is allergic to Penicillin. Which medication would the patient most likely be prescribed? 10. A 25 year-old female patient with pneumonia is prescribed Doxycycline. What question is important to ask the patient prior to administration of this medication? 11. Select all the medications used to treat pneumonia that are narrow-spectrum? 12. A patient is admitted with rupture of the Achilles tendon. The patient was recently treated with antibiotics for pneumonia. Which of the following medications below can cause this adverse effect? 13. A patient is being discharged home on Doxycyline for treatment of pneumonia. Which statement by the patient indicates they understood your education material? 14. You are about to hang a bag of intravenous Vancomycin for a patient who has severe pneumonia. Which statement by the patient causes you to hold the bag of Vancomycin and notify the doctor immediately?